This document is based on the definitions and requirements for restore logic outlined in new-idea-for-extension-cases.md. it is open and is the extension of an available case. Observation: the decision to shard by case ID means that the number of levels in a case hierarchy impacts restore performance. The minimum number of queries needed to retrieve all live cases for a device can equal the number of levels in the hierarchy. The maximum is unbounded. Non-partitioned queries do not scale with respect to the size of cluster, thus they are discouraged. Queries spanning multiple partitions … tend to be inefficient, so such queries should be done sparingly. A particular cross-partition query may be required frequently and efficiently. In this case, data needs to be stored in multiple partitions to support efficient reads. Potential optimizations to allow PostgreSQL to do more of the heavy lifting for us. Probably not? Some domains are too large. Copy related case index data into all relevant shards to allow a query to run on a single shard. Nope. Effectively worse than sharding by domain: would copy entire case index to every shard because in a given set of live cases that is the same size as or larger than the number of shards, each case will probably live in a different shard. Maybe use hierarchical keys since ownership is strictly hierarchical. This may simplify the sharding function. Copy or move data between shards when ownership changes. Simplified/minimal table definitions used in sample queries below. Presence of a row in the case_index adjacency list table implies that the referenced cases are available. The case_index is updated when new data is received during a device sync: new case relationships are inserted and relationships for closed cases are deleted. All information in the case_index table is also present in the CommCareCaseIndexSQL and CommCareCaseSQL tables. Likewise for the cases table, which is a subset of CommCareCaseSQL. case_utils.py references prescription and voucher while the sheet does not. case_utils.py has referral related to episode, not person as in the sheet. With the current sharding (by case ID) configuration, the maximum number of queries needed to get all live cases for a device is 5 because there are 5 levels in the case hierarchy. Update: this is wrong; it could be more than 5. Example: if a case retrieved in the 5th query has unvisited children, then at least one more query is necessary. Because any given case may have multiple parents, the maximum number of queries is unbounded. All queries below are simplified for the purposes of demonstration. They use the simplified table definitions from the Data Structure section in this document, and they only return case IDs. If this algorithm is implemented it will likely make sense to expand the queries to retrieve all case data, including case relationship data, and to query directly from CommCareCaseIndexSQL and CommCareCaseSQL. The term “child” is a general term used to refer to a case that is related to another case by retaining a reference to the other case in its set of parent indices. It does not refer to the more restrictive “child” relationship type. OWNER_DOMAIN - the domain for which the query is being executed. OWNER_IDS - a set of user and group IDs for the device being restored. NEXT_IDS - a set of live case IDs. The IN operator used to filter on case ID sets should be optimized since case ID sets may be large. Each of the above queries is executed on all shards and the results from each shard are merged into the final result set. Objective: retrieve all live cases for a device with a single query. This query answers the question Which cases end up on a user’s phone? The sharding structure will need to be changed if we want to use something like this. Do we have documentation on existing restore logic? What does it mean for an extension case to “live its own life”? Is it meaningful to have an extension case apart from the parent of which it is an extension? How are the attributes of an extension case “living its own life” different from one that is not living it’s own life (I’m assuming not living its own life means it has the same lifecycle as its parent). 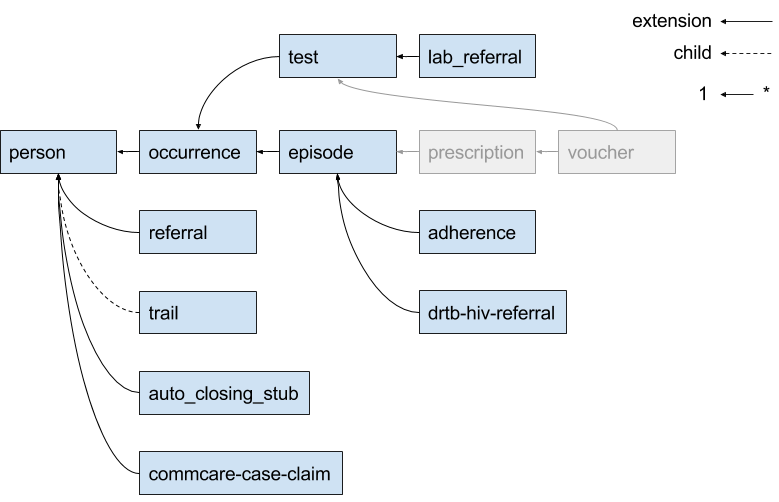 Is there an ERD or something similar for UATBC cases and their relationships?